Window Shutters Thornbury, Gloucestershire; Interior Plantation Shutters from Just Shutters your local specialists! Your local experts Rob and Linda Reeves offer the finest choice of shutters, coupled with their passion and flair for design. Our shutters give any window or door designer good looks, light and shade control and come with a lifetime guarantee. Call us on 0117 370 1594 or download an inspirational brochure. Thornbury, the charming market town steeped in history, has an eclectic mix of houses. From its charming country cottages, to historic town centre homes, and even more modern offerings thrown into the mix. We at Just Shutters have experience of over 8000 installations in a wide variety of properties; from listed buildings, to brand new developments and everything in between. So you can be confident that we understand the needs of properties old and new. It is our promise to treat your house like a home and leave it clean and mess free when we install your shutters. What’s more, with the UK’s widest range to choose from, we are sure to design and create the perfect shutters to suit your taste and style. Shutters are a style statement. They make the most of any window or door, and creating a feature that enhances the room. Influenced by the pages of beautiful homes magazines, top boutique hotels and interior designers, homeowners have embraced shutters as a design choice. – Shutters are versatile, hard wearing and are made-to measure, fitting any window or door perfectly. – They are wipe clean, low maintenance and hygienic. – Shutters are safe in rooms with children, no hanging chords or fabrics. – They do not fade, mould or warp in the sun. – Shutters provide effective light and shade control. – Privacy and security is enhanced creating a private haven. – Heat loss is reduced by up to 62%. – Long lasting value – shutters come with a lifetime guarantee and add value to your home. We are the local experts; we have over 7000 happy customers and the finest reviews in our industry (please see just some of our testimonials below). Since 2006 we have built a passionate, specialist plantation shutter company. We listen to our customers and work to ensure our products and service are unsurpassed. If you are considering plantation shutters for your home or business, please give us a call and we will show you how we earned our reputation! Our team are all experts on window shutters Thornbury Gloucestershire, call them today on 0117 370 1594 or follow the links for a brochure or appointment. Please see more at checkatrade for over 1800 happy customers reviews. Installation of cafe style shutters in four downstairs rooms. Shutters fitted to front and back of house. 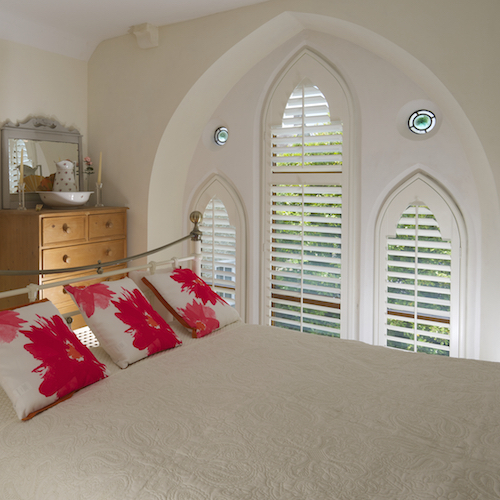 Installation of bedroom and bathroom window shutters in Weston-Super Mare. Supply and installation of plantation shutters.